WASHINGTON — The Trump administration is calling for an urgent halt to the Saudi-Iran proxy war in Yemen and the start of negotiations in November toward a political settlement. The renewed push for a political solution in Yemen comes amid growing criticism of U.S. military support for Saudi Arabia’s Yemen air campaign in the aftermath of the killing of Saudi writer Jamal Khashoggi in the Saudi Consulate in Turkey. 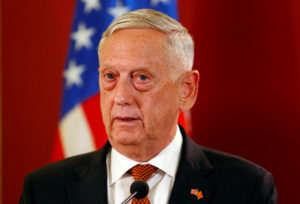 “The time is now for a cessation of hostilities,” Pompeo said in a written statement Tuesday evening shortly after Defense Secretary Jim Mattis made similar statements in an appearance at the United States Institute of Peace. Mattis was more specific than Pompeo in his call for urgent movement toward a political solution to the fighting. He said a cease-fire should take effect within 30 days. “They need to knock it off,” he said. The conflict in Yemen, the Arab world’s poorest country, began with the 2014 takeover of the capital, Sanaa, by the Houthis, who toppled the internationally recognized government. The Saudi-led coalition allied with the government has been fighting the Houthis since 2015.